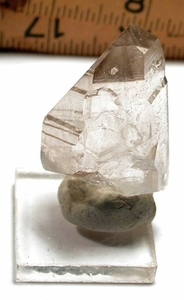 Natural smoky quartz from Arkansas is so rare that it's nearly a mystery. We're pleased to have a very few - and in very fine quality from Garland County for you. This particular slightly flattened crystal of 5/8x 1-1/8x 1-3/4" color-changes, too. It has 14 prism and termination faces, including a complex S/X face linking the main, NINE-edged channel face to two side prism faces. Outstanding clarity with slight devic veils and foils, many many record keepers. Perfect growth craters, glitter and doubly-terminated barnacles to 3/16". One, 1/32" tip flea doesn't detract.